I booked 4 travel Global WiFi as always. 4GLTE 250MB plan, 190 JPY/day! really reasonable:) I think Wi-fi connection was available at Aulani including pool area when I visited before. So I will use it for google map while I will be in Waikiki area. Booked Roberts Hawaii 's Airport express shuttle. Reservation can be made through web in Japanese language. FYI, there is another shuttle bus service, Speedi Shuttle, 22.70 USD(without Tips). As my itinerary is 3 nights at Aulani and 3 nights at Waikiki, I have to move from town to town. However I decided not to book any transportation in advance. I might want to be at Aulani as much as I can, or I might want to go shopping earlier... I will decide what I feel at the time. Maybe I will call taxi or Uber. JCB card holders can use Waikiki Trolley Pink Line (between Waikiki and Ala Moana) for free. Originally it costs 2 USD per one way. A good service for travelers without trolley service running by travel agencies. The website says the promotion will end on 2019 March-31st, but it often extends from 2009. No in advance application needed, just show JCB logo to trolley driver. I think the basic preparation is good enough so far. Daily detailed schedule will be decided according to hotel's activity schedule. 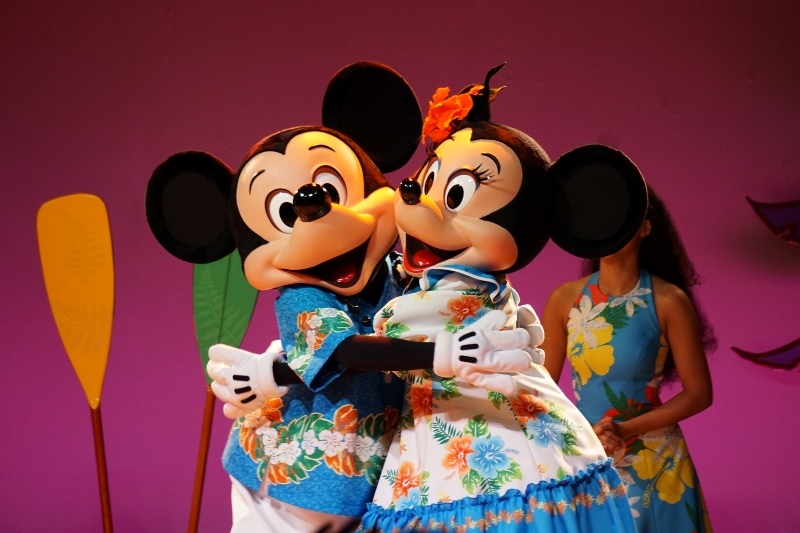 I would like to have Lomi Lomi treatment, try Ukulele, and have greetings with Disney Characters! But let me decide it on arrival. 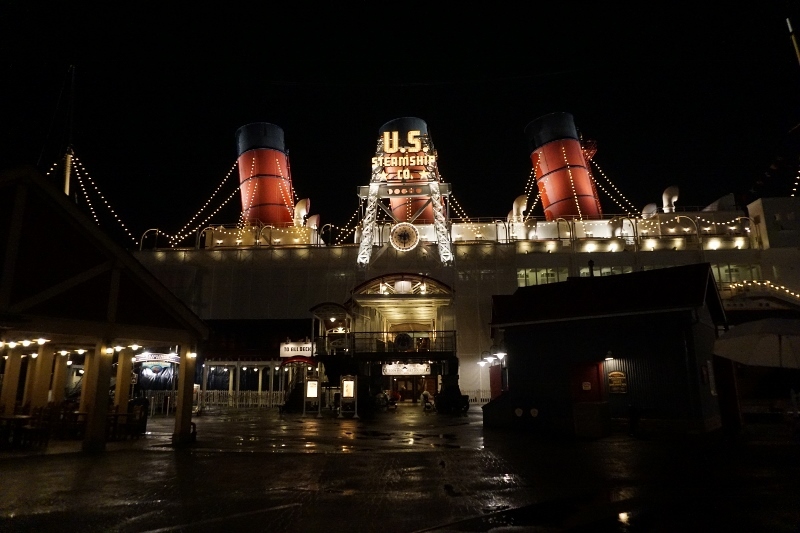 Hi, I visited Tokyo DisneySea last night. It was the last day of 3 days holidays, but not so many guests were there because of heavy rain. I took pictures a lot. Halloween decoration was really gruesome with illumination. 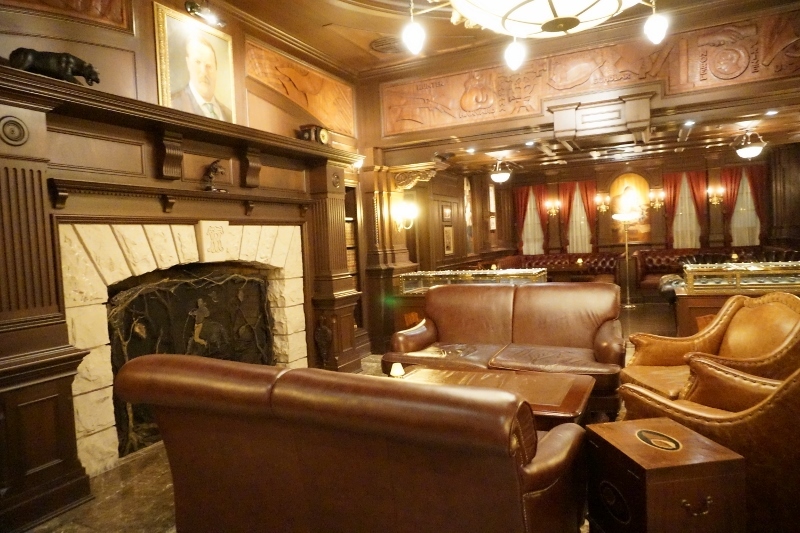 By the way, as I felt to drink last night, I went to The Teddy Roosevelt Lounge for dinner. It is on 2nd floor at S.S. Columbia. 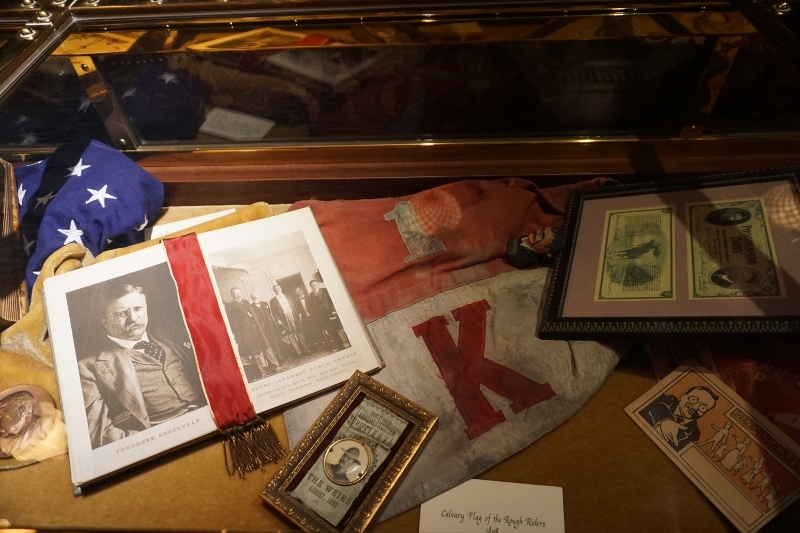 Its name is inspired by President Theodore "Teddy" Roosevelt, one of America's leaders. Inside the lounge, everything was luxury. I couldn't believe I was in a theme park. 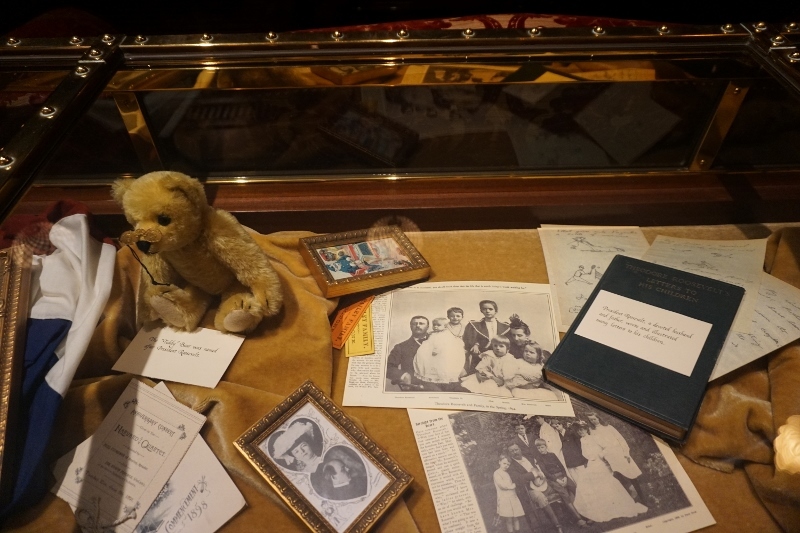 "Teddy" bear was also displayed, and bar counter was available. 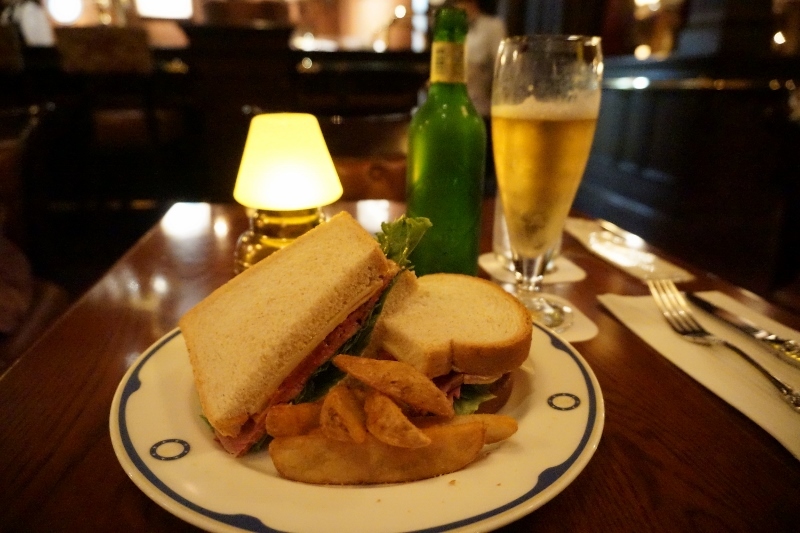 First I had Heartland beer (720 yen), then pastrami sandwich with graham bread (1300 yen). Tomato sauce inside was so good. 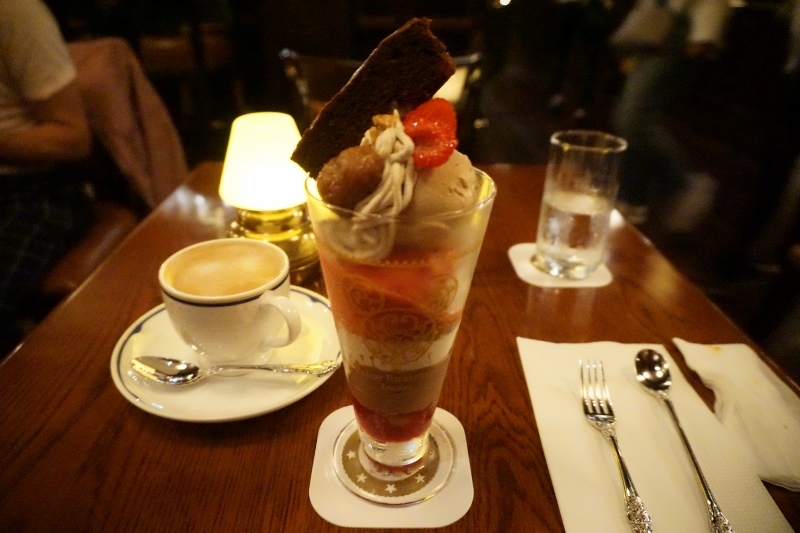 Finally I had seasonal parfait, chestnut and raspberry parfait (1230 yen) as dessert. 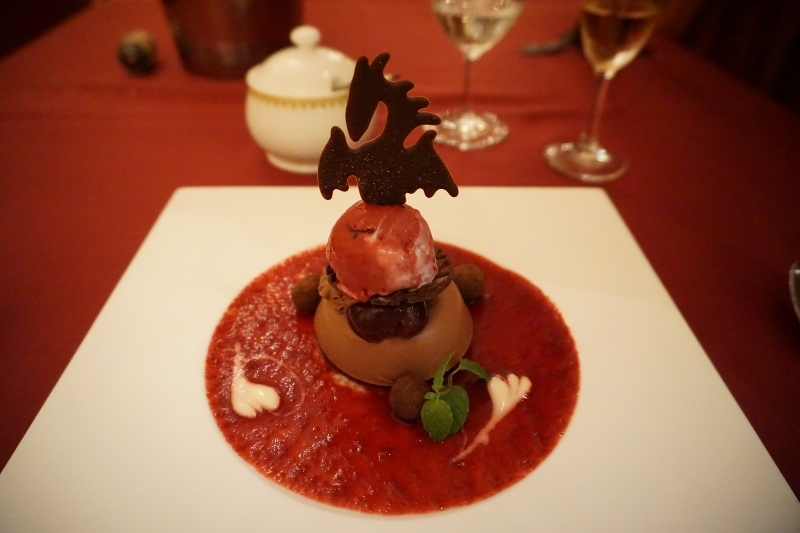 It contained chestnut cream, ice-cream, brownie, raspberry sauce and chocolate mousse. Perfect! 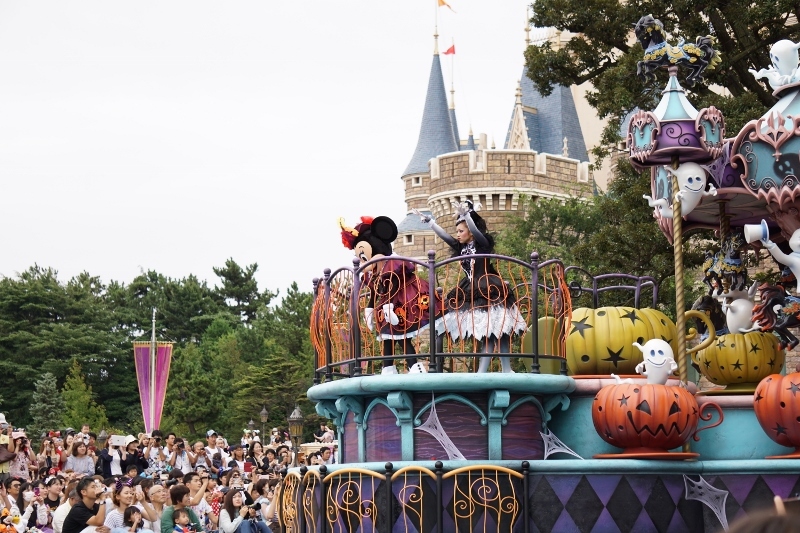 Hi, I visited Tokyo Disneyland and enjoyed Disney Halloween today. It was the middle day of 3 days holidays. 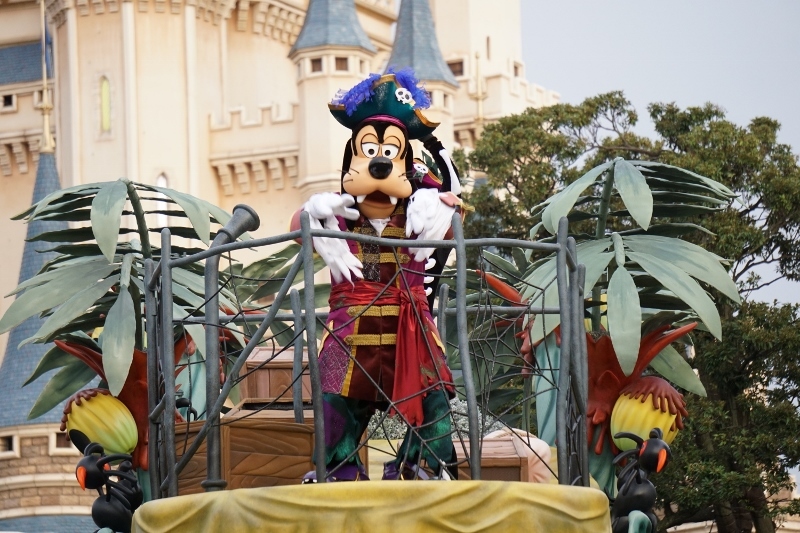 Really crowded and the admission of both Tokyo Disneyland and Tokyo DisneySea was restricted. Spooky "Boo!" 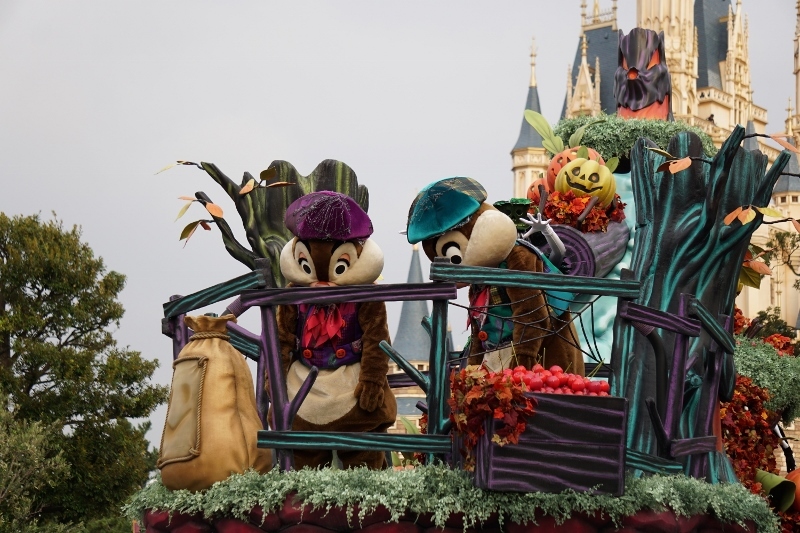 Parade is the new Halloween parade at Tokyo Disneyland. 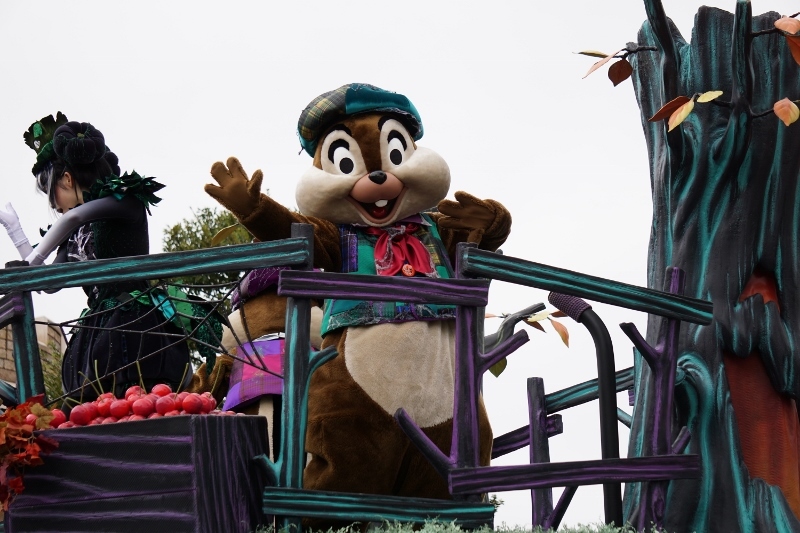 It starts from Toon Town, and goes to Haunted Mansion, Fantasyland. 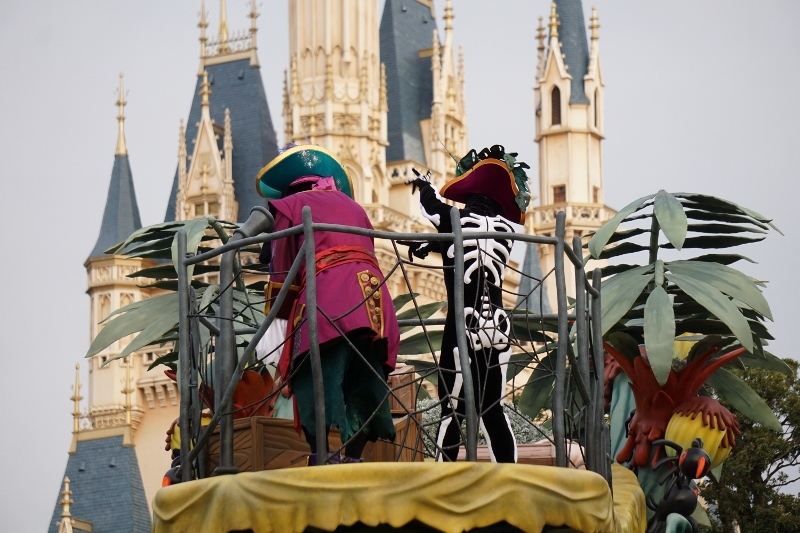 The route is opposite direction from Dreaming Up!, the day time parade. At Plaza and Westernland, the parade stops and has show mode. I heard characters changed their outfit during the first show mode at Plaza, then I tried to watch it there. 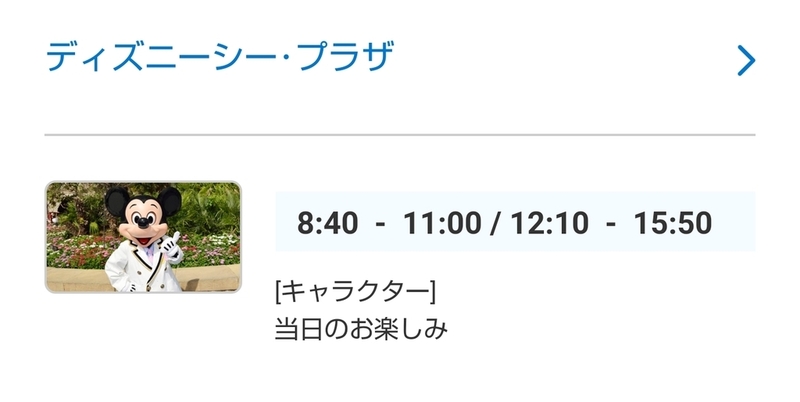 Today's show time were 10:40am and 4:45pm. I got the park at 8:10am, but almost all space around Plaza was already filled with guests. 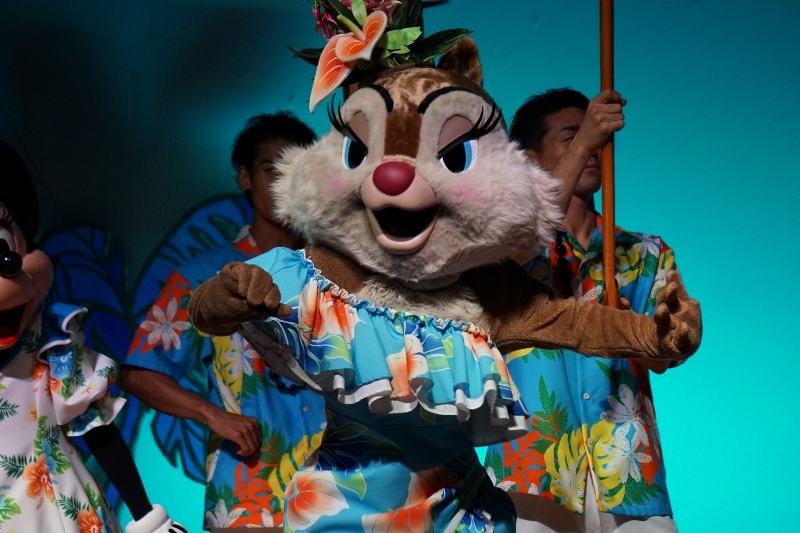 So, I watched it at the end of Plaza, and moved to the position where I could watch Chip and Dale soon after the first show ended. Then I stayed there before the 2nd show started. 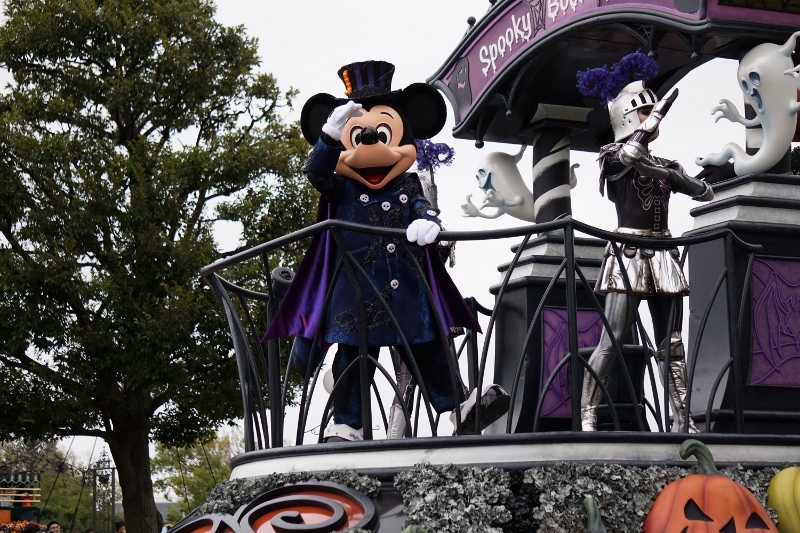 It was long day:( However, the first row along parade route was filled right after the first show. 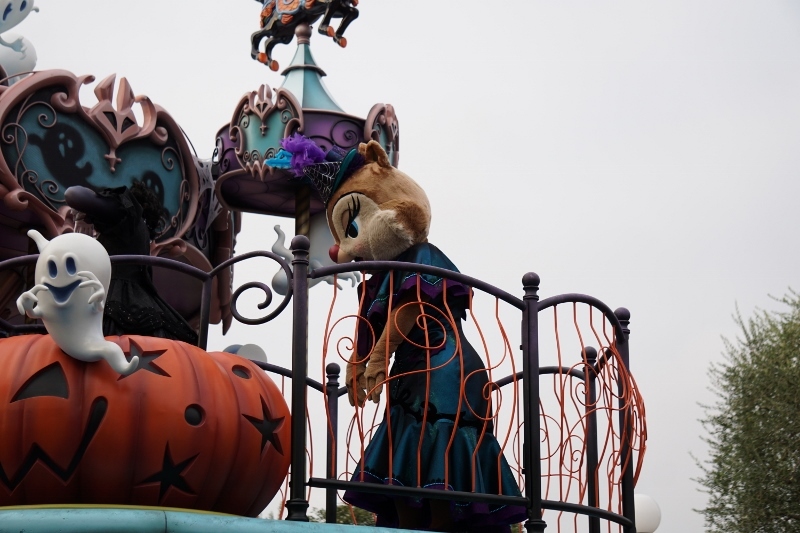 And no one left there after the day time parade, "Dreaming Up! ", started at 2:00pm. I realized it was very much crowded today. Here are pictures taken today, both first show and 2nd show. 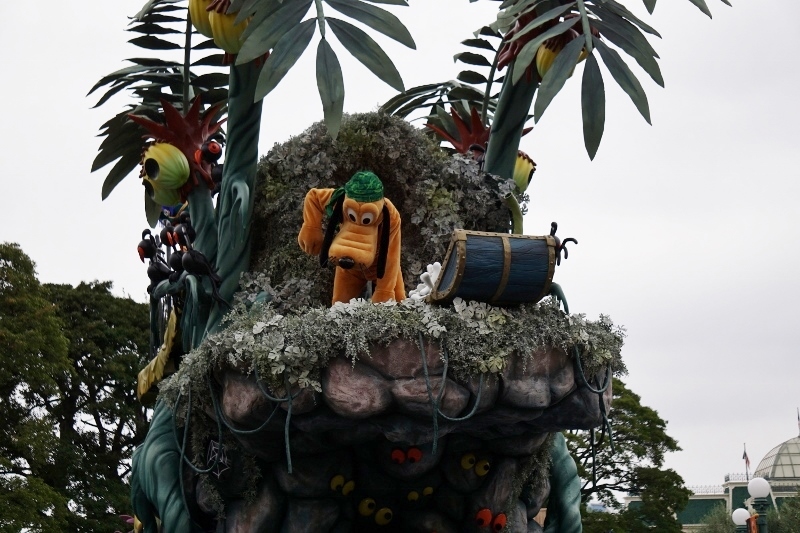 The floats are like attractions in Tokyo Disneyland. 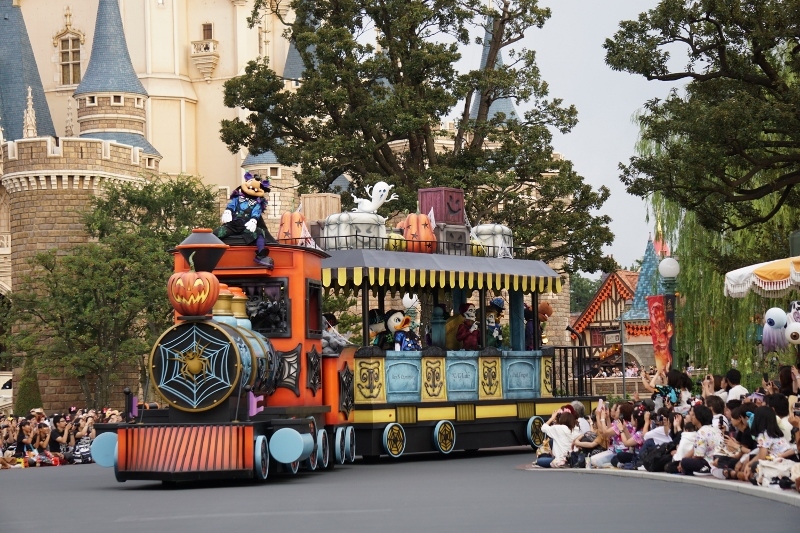 The first float was Western River Railroad with Max. While looking at characters, they were manipulated by ghosts. Sometimes, they pulled down their arms, or turned. Looked strange. That means I should watch it again! I will try to watch it at around Westernland next time. Hello! 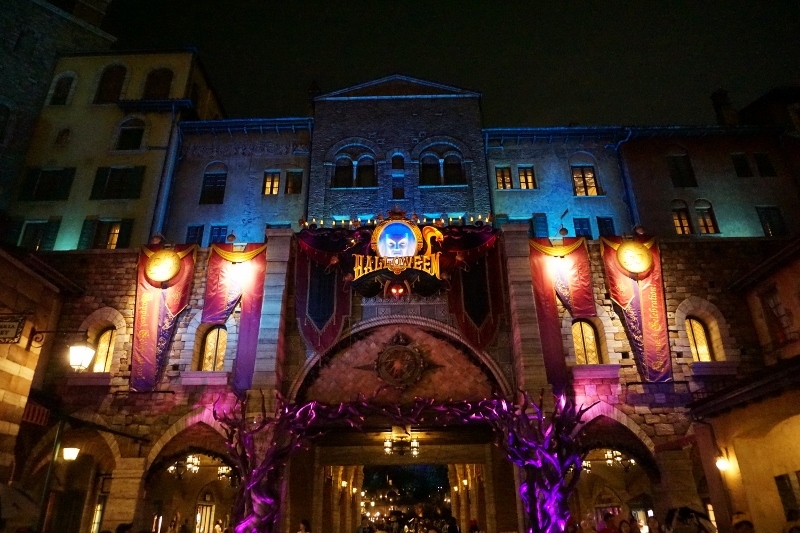 Last Saturday, I enjoyed Character Greeting at Tokyo DisneySea, then I had Halloween Special Course at Magellan's. 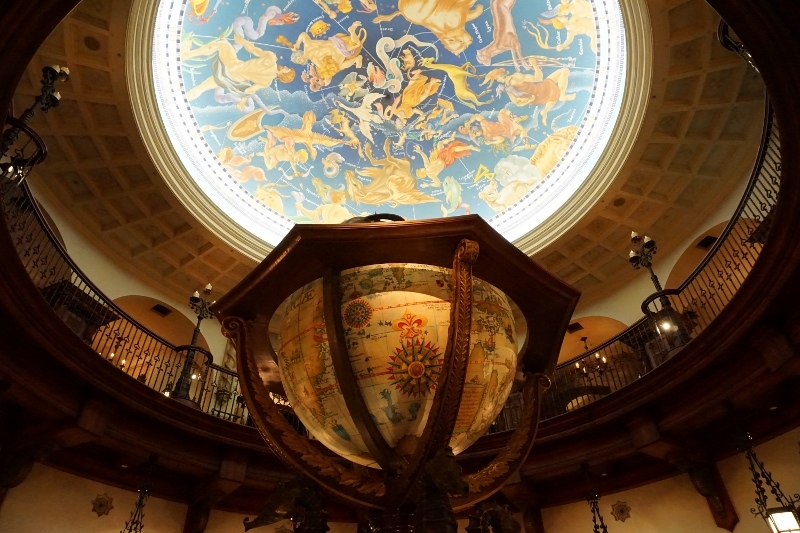 Magellan's is a table service restaurant at Mediterranean Harbor. It is named in honor of Ferdinand Magellan, the renowned explorer from the Golden Age of Exploration. 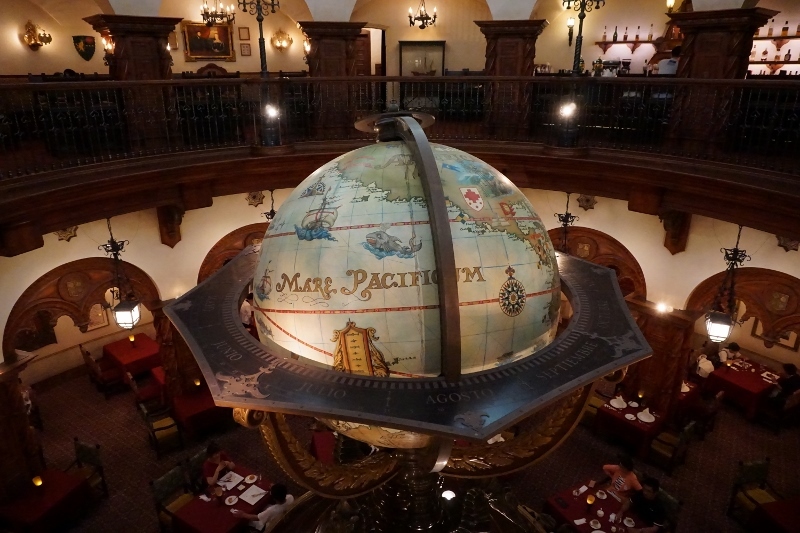 There are a big globe and an astronomy chart inside the restaurant. Priority Seating bookings are available, so I recommend to book in advance. I booked a table at 6:10pm. 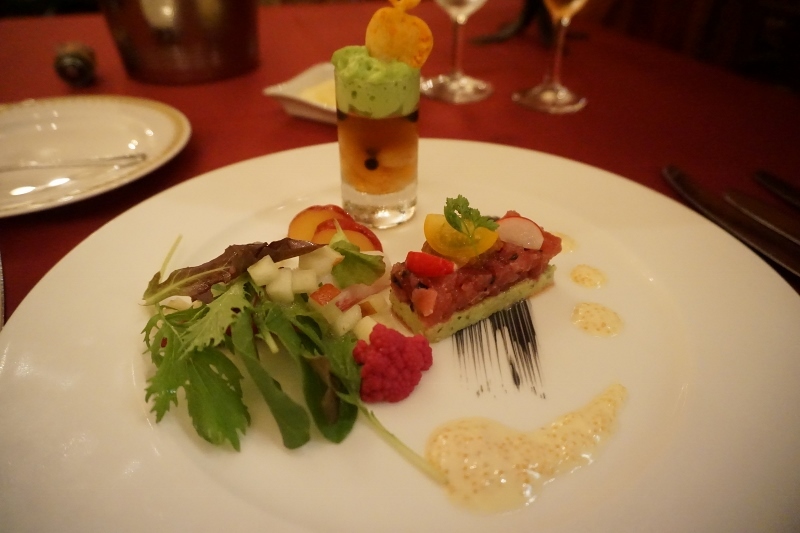 Full-course meals served, 3600 yen and 4500 yen for lunch, and 5700 yen and 7800 yen for dinner. In addition to these general course, special course of the season (event) is also available. My target was Halloween special course, 8700 yen. The starter was Tuna tartar, and shrimp consommé jerry. 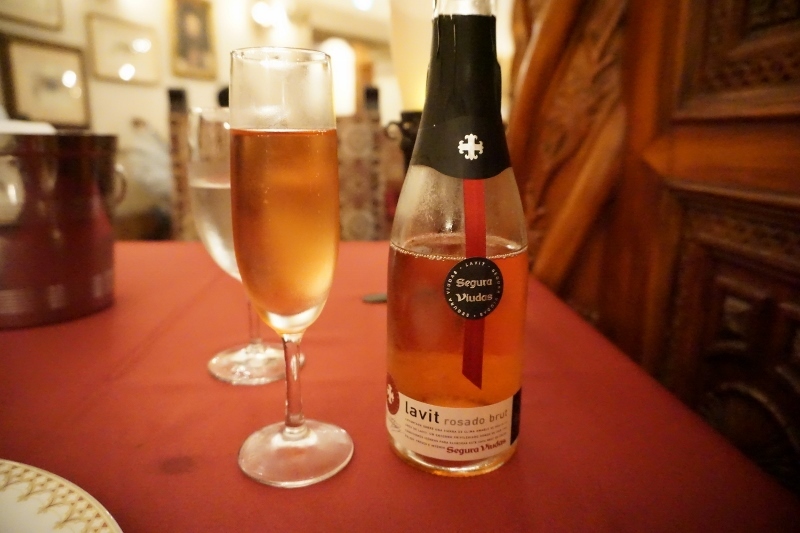 I ordered Spanish Cava as well. Bread was served. The next dish was fish. 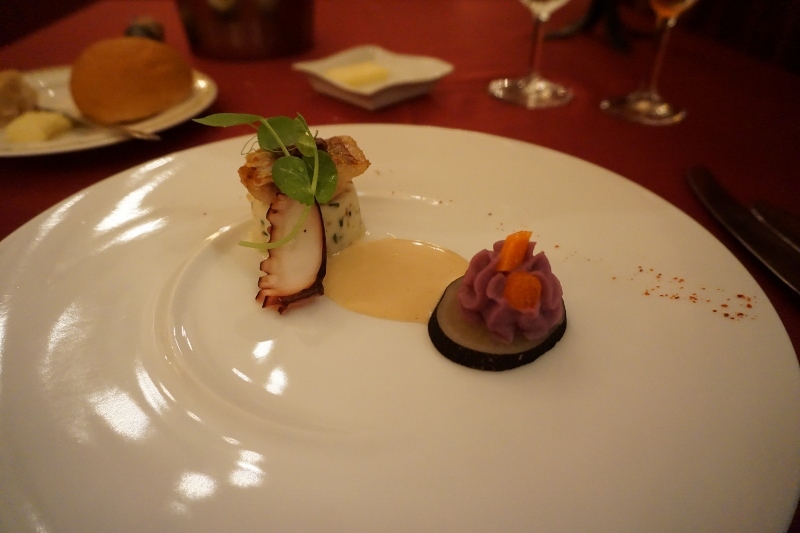 Whitefish poeler and seafood mousse. 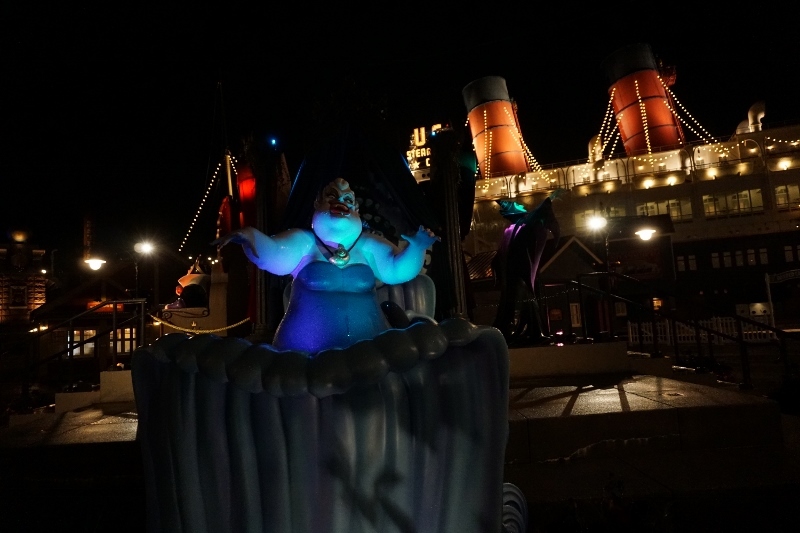 As the theme of Halloween event at DisneySea is "Villains", octopus like Ursula and garnish like Jafar were on the plate. 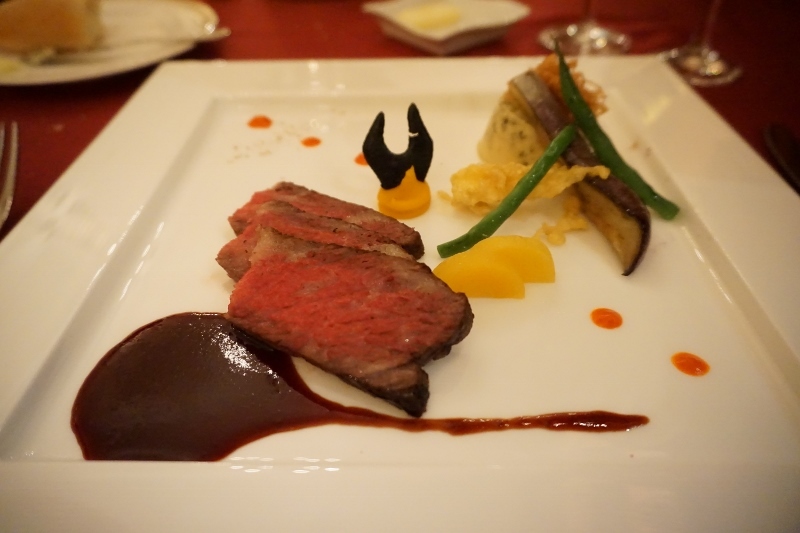 The main dish was Roasted Wagyu beef and mushroom furan. Is this the head of Maleficent? Wagyu was so good. Then dessert was Chocolate mousse cake and cassis ice cream. 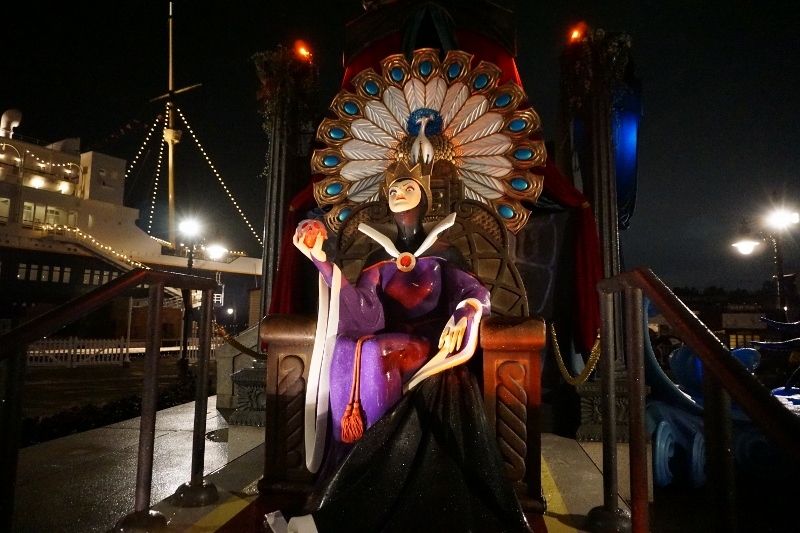 It was so cool, Maleficent Dragon from Fantasmic!, the night entertainment! The red source like fire of the dragon. Chocolate cake was very rich and sour cassis was nice for chocolate. 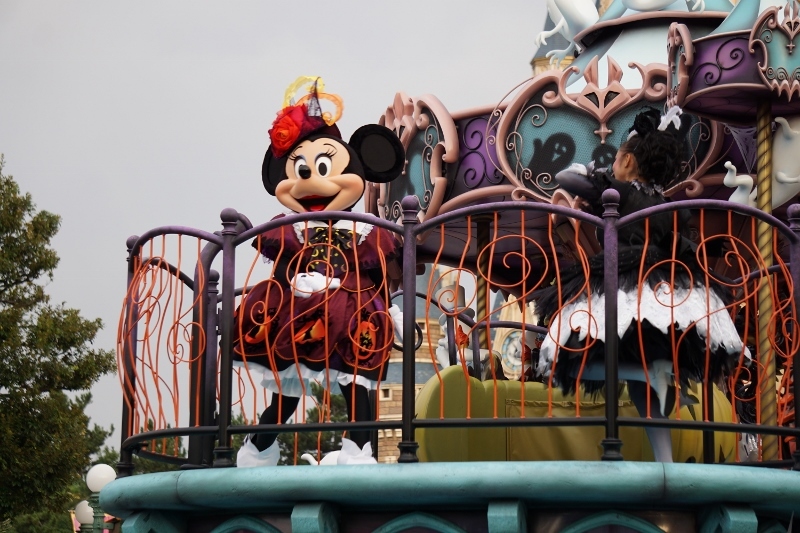 I sometimes wrote that I had very good time to meet and greet Disney Characters at Disney Parks overseas. 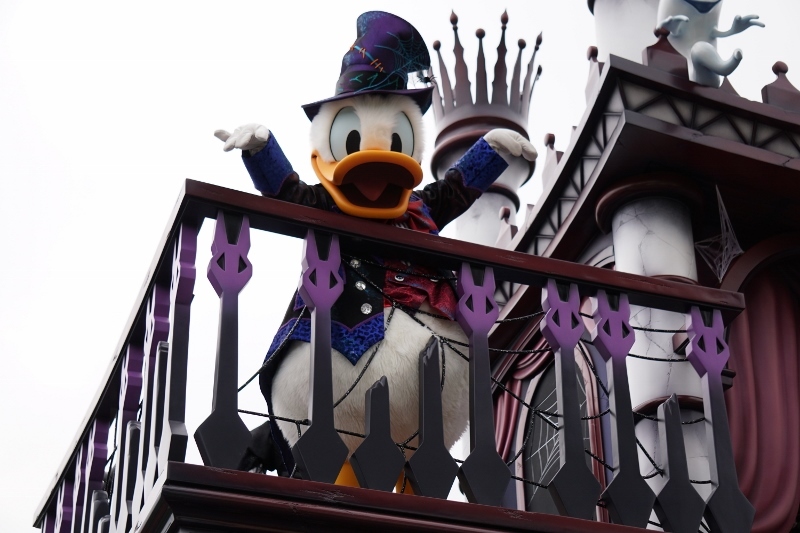 However, I didn't meet characters at Tokyo Disney Resort. 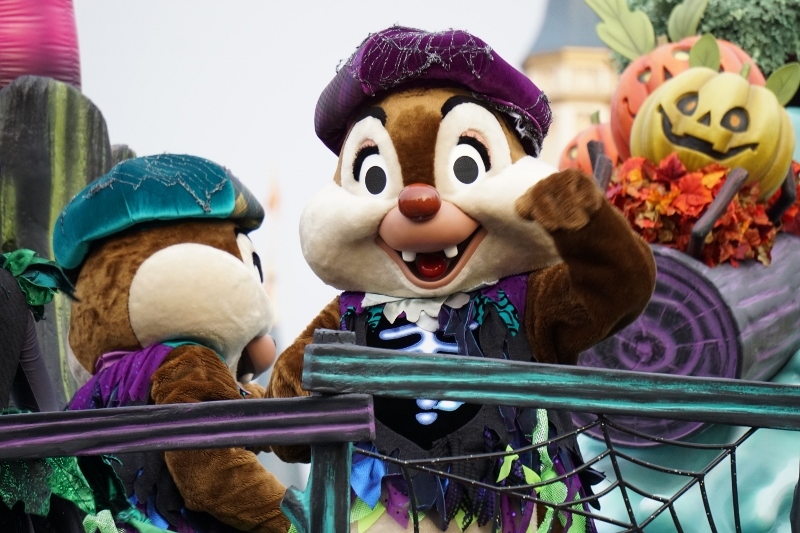 I thought this was unfair for Tokyo Disney Resort as it looked bad for Character Greetings. 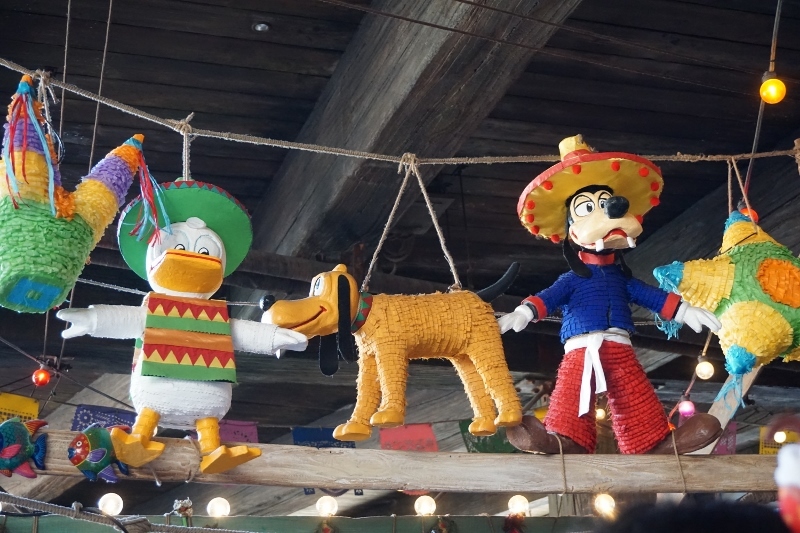 So I tried to meet characters at Tokyo DisneySea. This is official greeting schedule of yesterday from web site. It is unexpectedly many. 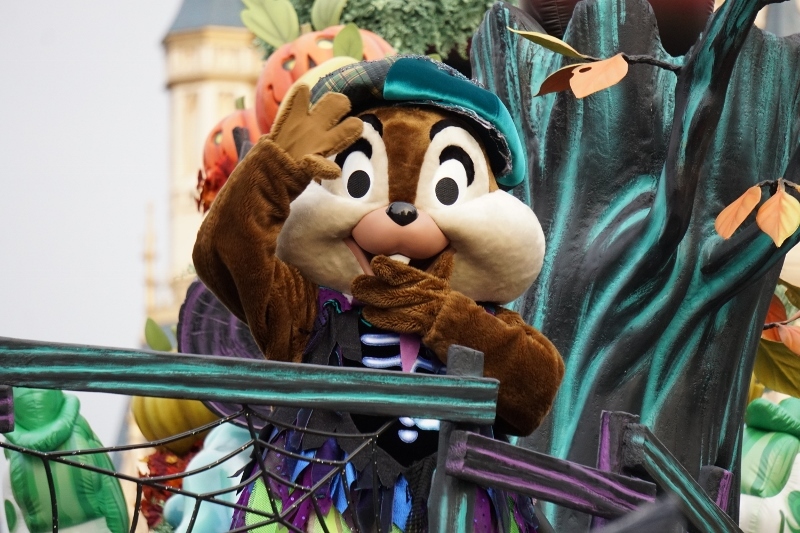 Daisy Duck is not in the list but she is available at Tokyo Disneyland (Woodchuck Greeting Trail), no official schedule of both Disneyland and DisneySea for Pluto, Chip and Dale. 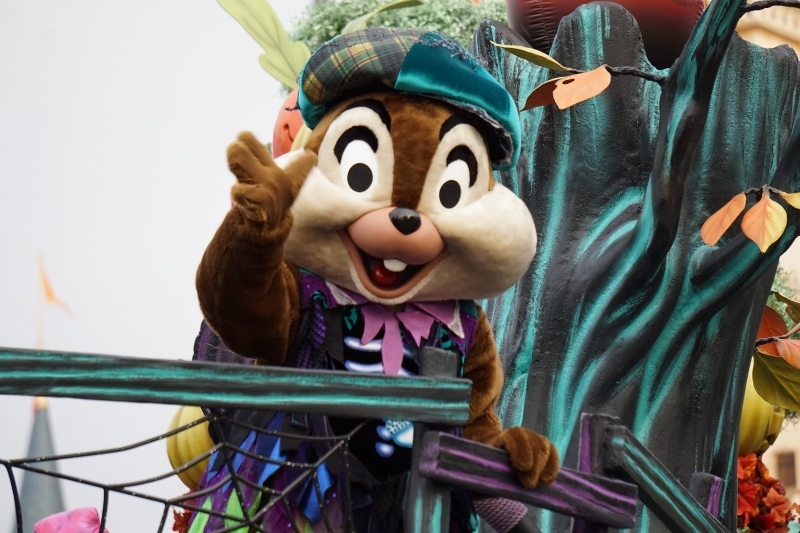 Then if I want to meet them I should catch walking characters and ask them for pictures (it is called "free greeting" between Japanese Disney funs) but I think it is a bit difficult for me. If I want to meet them certainly, overseas Parks look better. 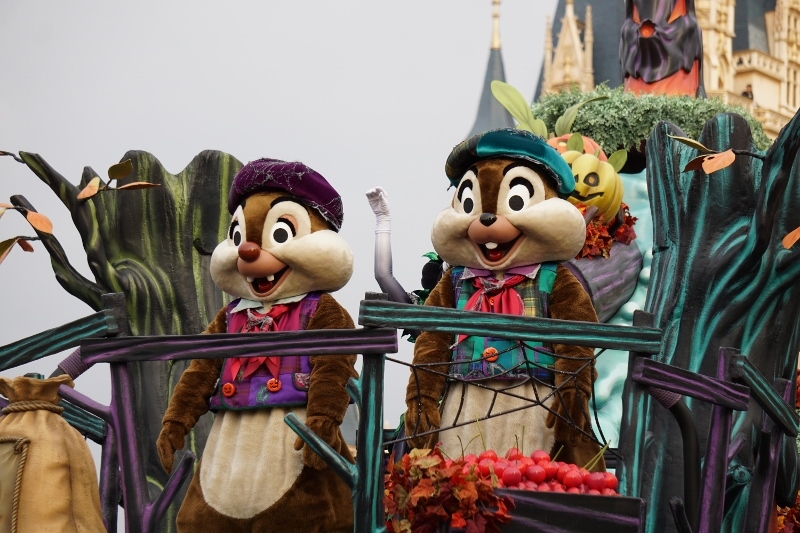 For example, I could meet them at Hong Kong Disneyland. Then let's dive into my experience on the day. 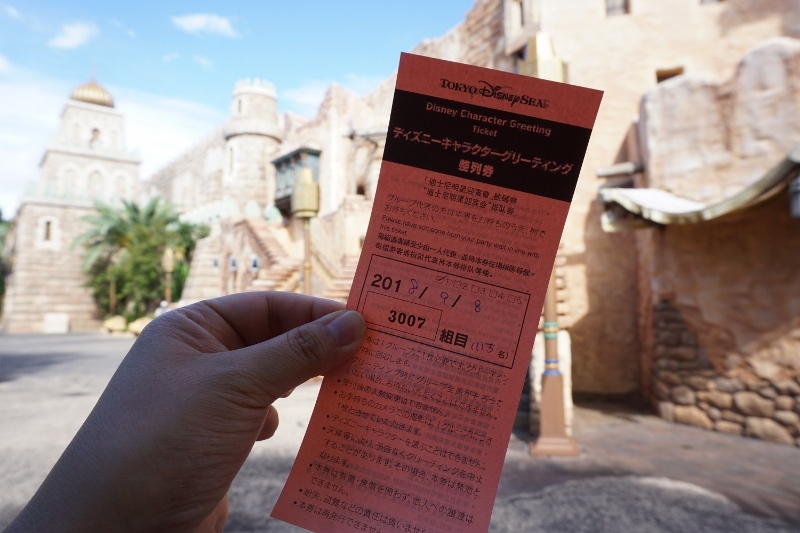 I arrived Tokyo DisneySea at around 8:30am. There was long queue already for greeting session at park entrance. 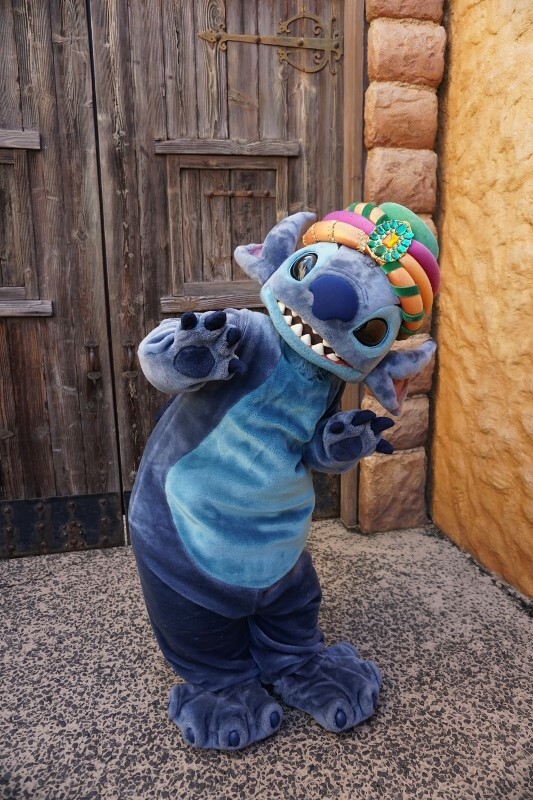 I moved to Arabian Coast because the greeting session with Stitch was until noon. He was around No.1 due to hot weather. I got a greeting ticket at 8:54am, it was before he came. and I took picture with him at 9:07am. 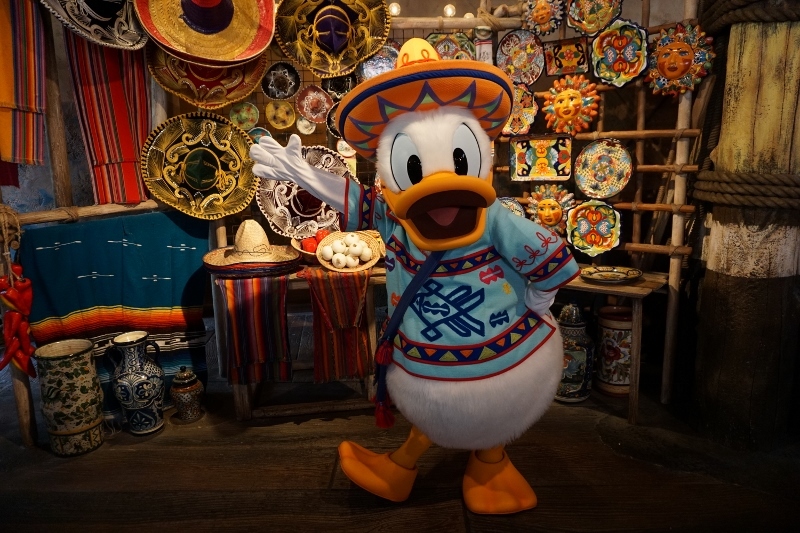 Next I moved to ¡Saludos Amigos! 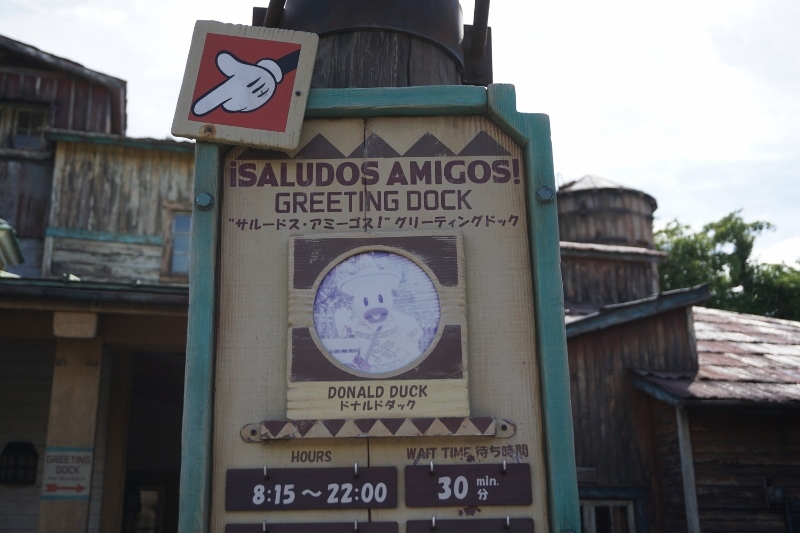 Greeting Dock (No.2) at Lost River Delta, where guests can meet Donald Duck. I started to be in the queue at 9:14am and wait time was 30 minutes. I took picture with him at 9:34am. No greeting ticket needed. 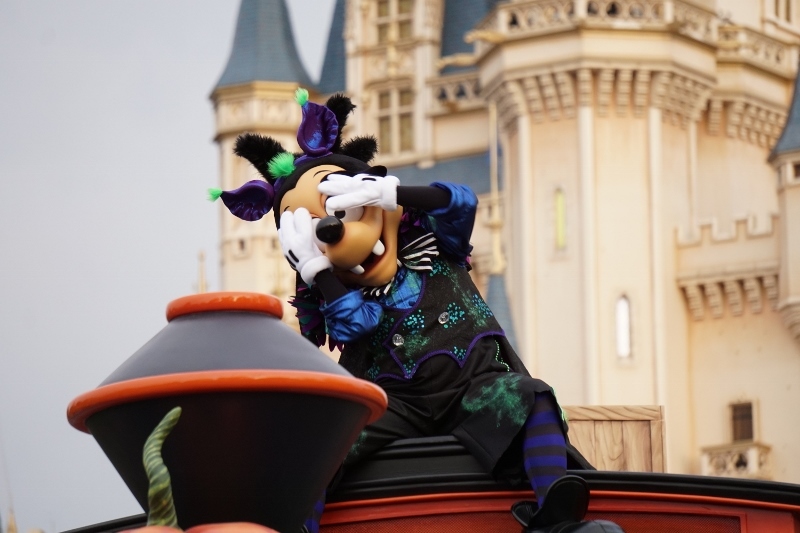 Hi, I go to Tokyo Disney Resort often these days, but I want to go traveling overseas. Luckily I will be able to take vacation in October. So.... 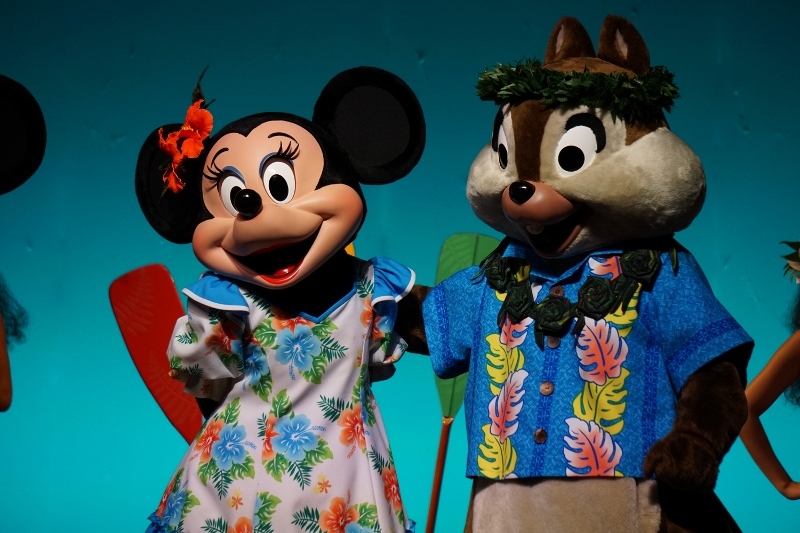 I booked the trip to Hawaii, Aulani, Disney Resort and Spa! I will go there alone. I booked ANA Award Ticket. The benefit of Award Ticket is date and flight can be changed. I booked flights for 5 nights travel, but I changed the date to enjoy 6 nights as I realized I could take day off more. The difficulty of traveling alone is hotel charges. The first 3 nights, I will enjoy pool and sea activity fully, then next 3 nights I will stay at a hotel far from Waikiki Beach. Vive hotel is in front of Kuhio street. This is my plan to reduce hotel charges. 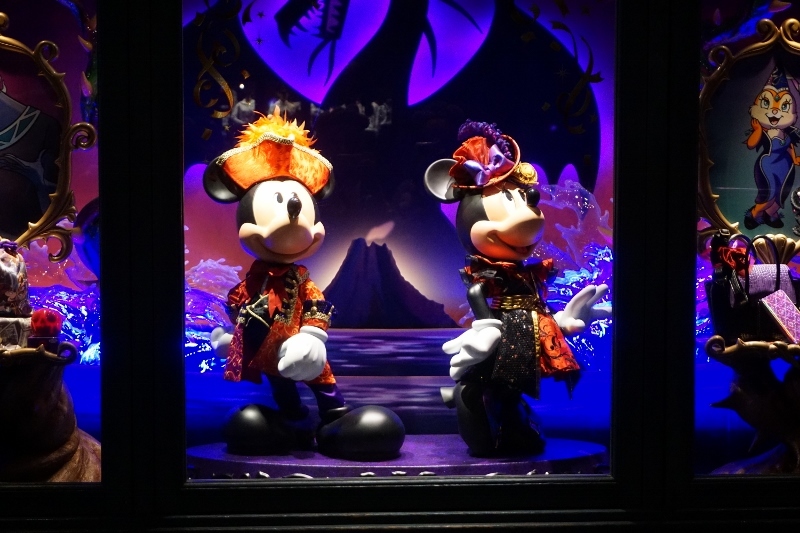 I feel it is still expensive:( I booked Aulani via Mickey Net, a travel agency. and booked Vive hotel via Expedia. 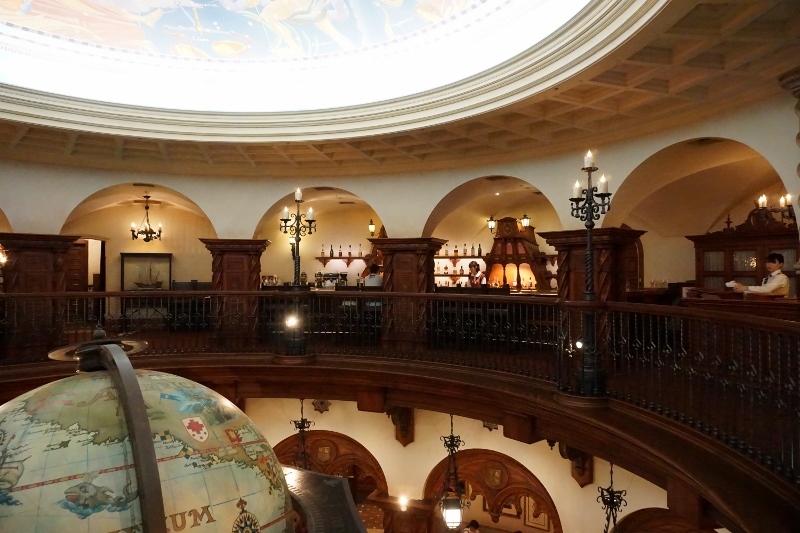 Mickey Net helps to make reservations of restaurants at Aulani for their customer. This is good service for those who hesitate to contact in English. I also asked them to do so for this time. 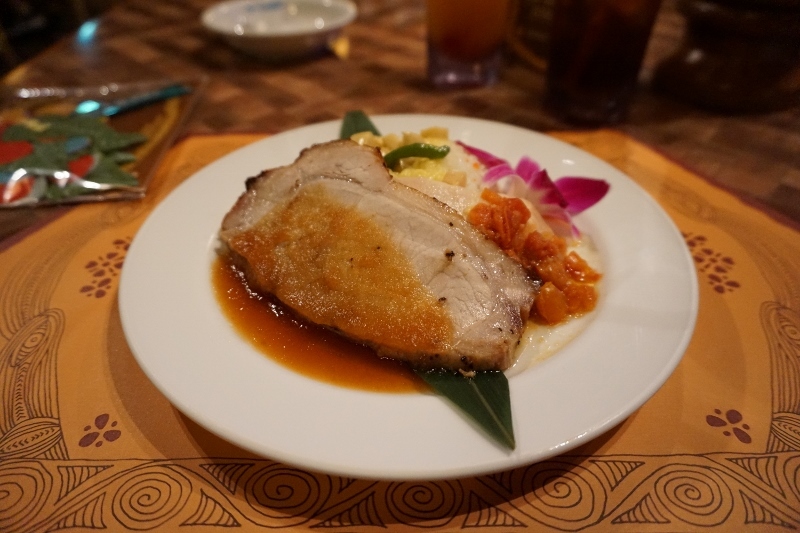 First, Disney Character Breakfast at Makahiki, and “MENEHUNE MISCHIEF” Character Dinner at Makahiki. 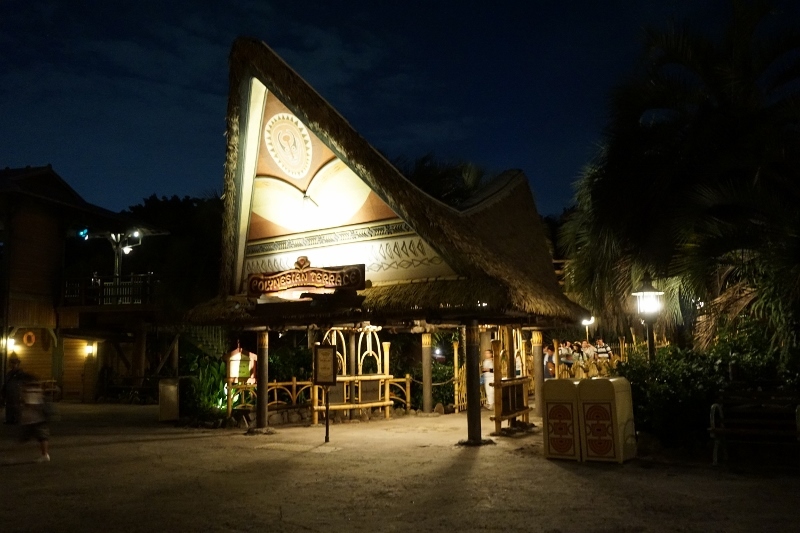 I debated whether “MENEHUNE MISCHIEF” Character Dinner or "KA WA‘A – A Lū‘au" Dinner Show. 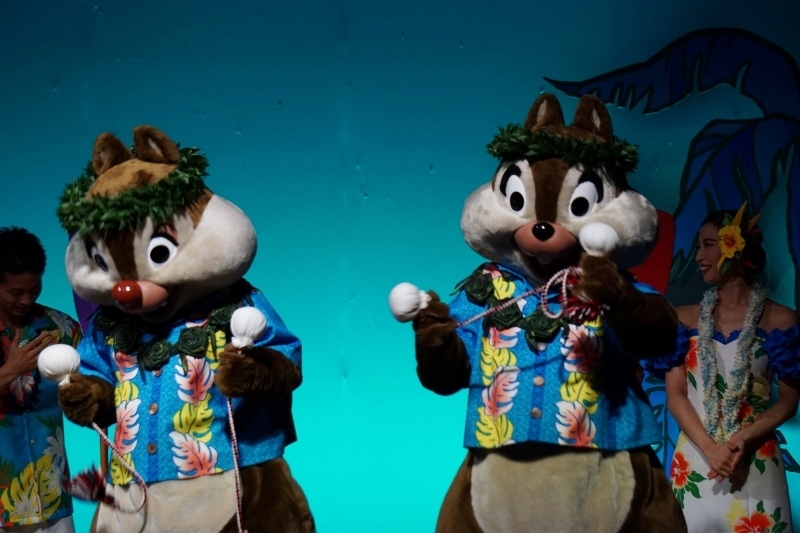 But I finally decided to try “MENEHUNE MISCHIEF” as I experienced another Lū‘au show before at another hotel. 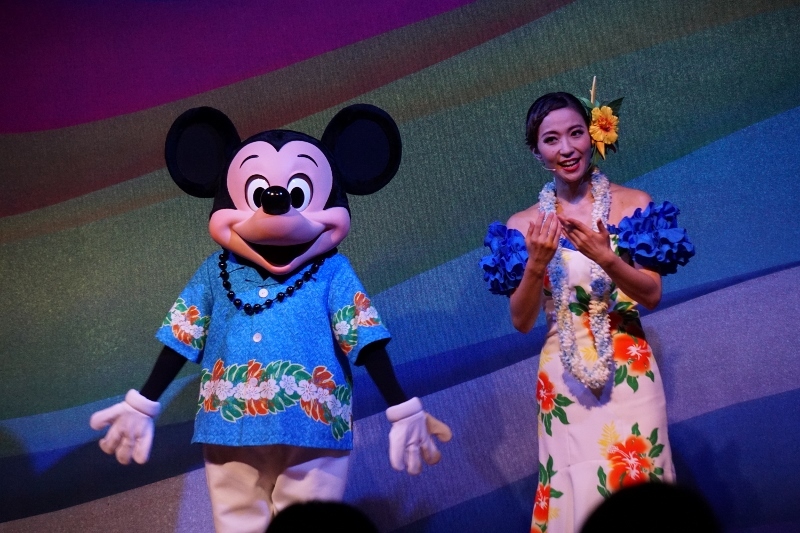 Hi, I watched Mickey's Rainbow Luau as I could make reservation. 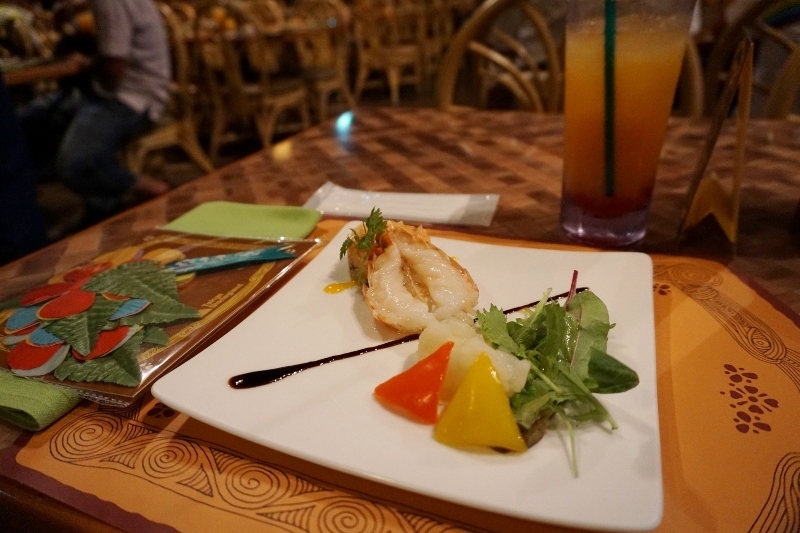 Mickey's Rainbow Luau is a dinner show at Polynesian Terrace Restaurant, Adventureland Tokyo Disneyland. 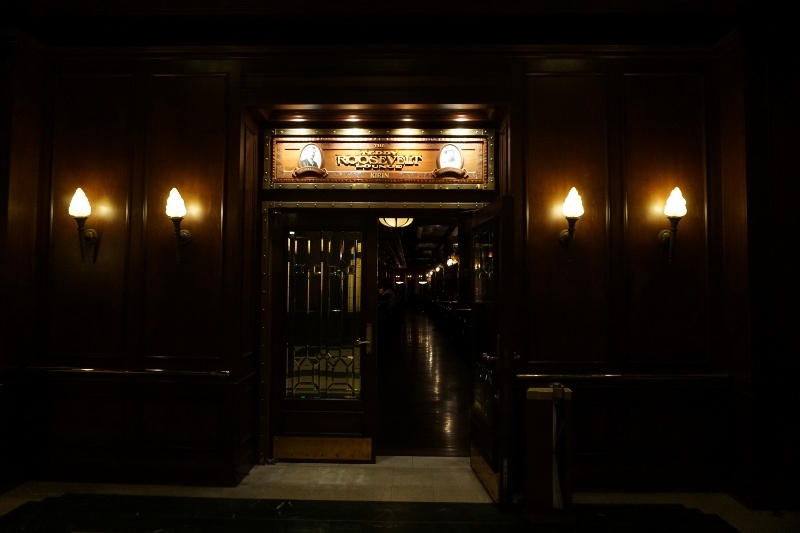 Advance online reservations are required to dine at this restaurant. 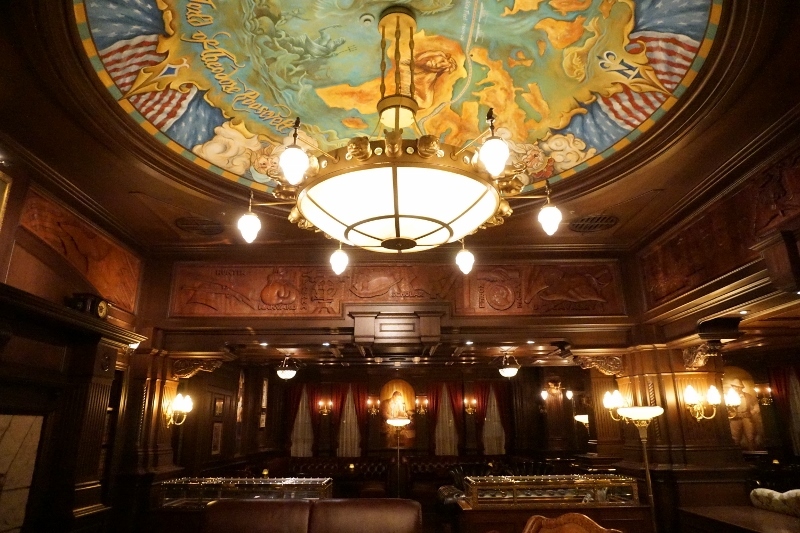 This restaurant is very famous and difficult to book, but luckily I found S class seat available for the day, thus I went there. Advance bookings can be made online from 9:00am one month before to 8:59pm the day before you wish to dine. 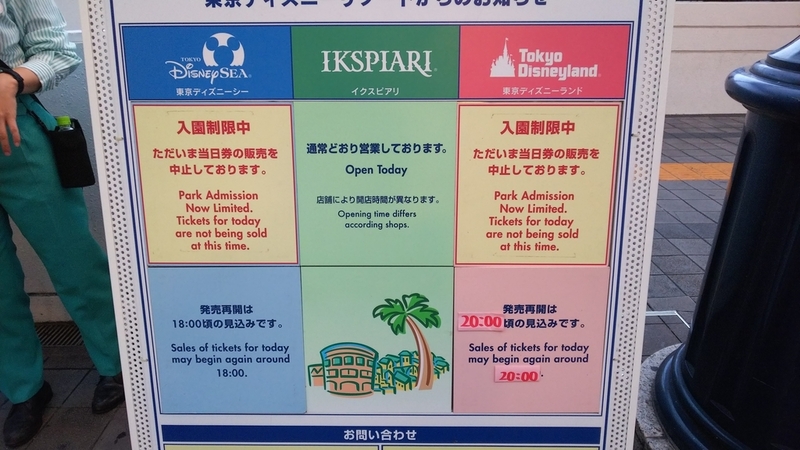 If seats are still available on the day you visit the Park, you can make a booking on the Tokyo Disney Resort website. Price for Adults are, S class 4940 JPY, A class 4530 JPY, and B class 4110 JPY. When I moved to my table, there already were starter and drink. The starter was salmon quinoa salad, marinated shrimp and pickles. The drink was Polynesian Punch, original non-alcohol cocktail. As it was very sweet, I ordered iced tea soon.Non-alcohol drink is free refil. Kuepe, kind of lei for wrist, was also there. It is more colorful than the one for the lunch show. In a mean while, the show started. 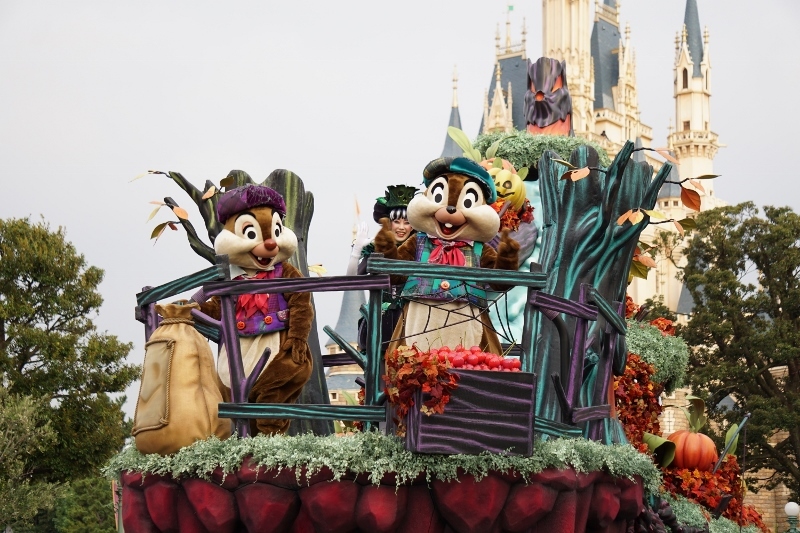 Mickey Mouse, Minnie Mouse, Chip, Dale and Clarice came and talked who would celebrate what kind of celebration. They walked around tables to greet guests. 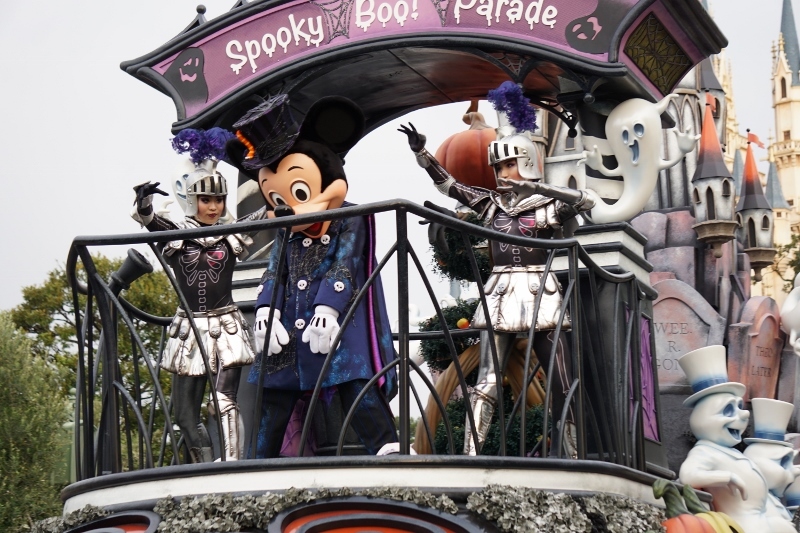 It was very short time but I was happy to greet them:) While characters were greeting, show dancers also came to guests, and asked what were their reason to celebrate on the day. After the first scene, meal time started. The main course was roasted pork Polynesian source, roasted fish, and butter rice. 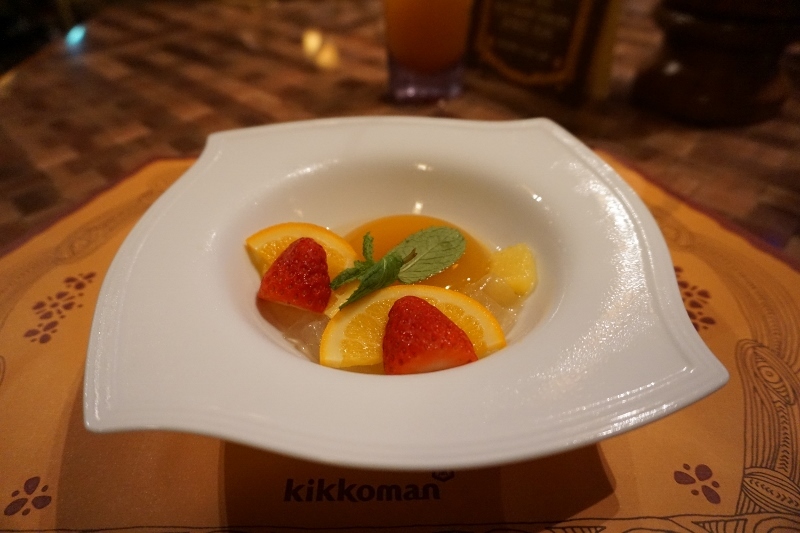 Then desert, orange and passion fruits jelly, came. The roasted pork was good. In fast there was not enough time to eat. 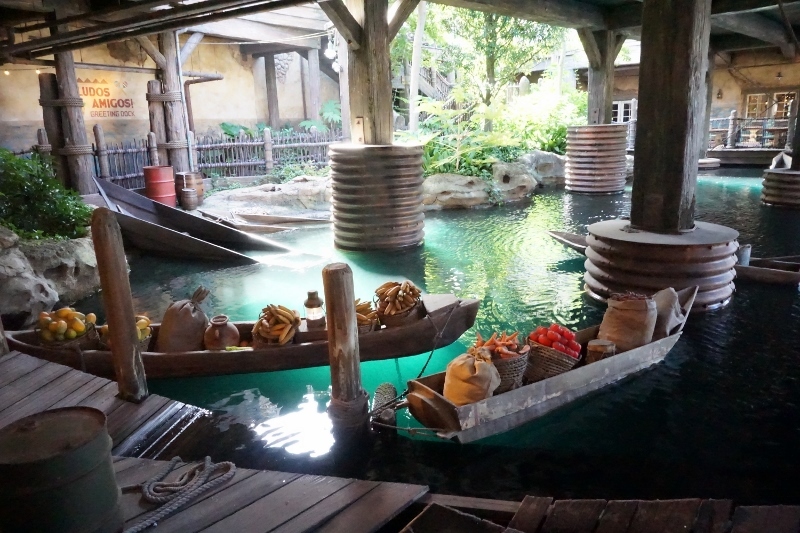 Guests could stay at the restaurant only for 65 minutes, but 50 minutes were show time. It means I had only 15 minutes to eat... needed to hurry.